What is eosinophilic granuloma complex? I'm building a resource page on this disease as it affects cats, and need your help. If you have any experience with this disease, or know of any resources on the subject, please let us know in the comments. Thanks! This disease is actually a group of skin conditions referred to as EGC, with various suspected causes. There are some discrepancies in the information I've found, including causes, types and names. Below are some highlights of what I have found so far. Wikipedia also mentions a fourth type, the least common type, which is caused by a mosquito bite allergy. Called atypical eosinophilic dermatitis, the lesions usually appear on areas with less hair, such as the bridge of the nose, the tips of the ears, and the pads of the feet. The Merck Veterinary Manual says that allergies to "fleas, food, or inhalants" may be at fault. So, allergy testing and dietary elimination trials are recommended. Idiopathic cases exist as well, meaning the cause is unknown. PetMD state that "eosinophilic granuloma complex is restricted to cats" and that eosinophilic granulomas that occur in other species, including dogs, are not part of the eosinophilic granuloma complex as related to felines. They also mention that breed does not play a role. If you have any information on this disease, please leave a comment. The brand I use is California earth minerals powder. I am pleased to say she is still free from this problem. Both my cats are on it and both are the healthiest they've ever been. She was 6 pounds when we started and now weighs around 8 pounds. Our other cat weighs approximately 11 pounds. He gets a slightly more rounded 1/8 teaspoon. For maintenance now I add twice a week to their food and I also get a brand called nature's variety Instinct limited ingredient food that also has clay in the moist food. They get that twice a week as well. I hope others that have pets see this and it can help them too. It has been a wonderful discovery for us and our pets. Which one did you get ? Terramin? I feel a great need to let others know what it was that freed our kitty from this nightmare. "Terramin" edible clay. She gets 1/8 teaspoon a day. How much does your kitty weigh? Hope you see this...My cat has been thru hell and back and I am just now learning she has this aweful thing. My 6 year old female began having mouth sores about every 6 months which was linked to a food allergy. The only thing that would help her recover was a steroid/antibiotic treatment. We tried for a few years to resolve the issue from occurring with no success. The vet recommended a low dosage steroid treatment for the remainder of her life. We didn't want to do this to her unless it was absolutely our last resort due to the fact it would shorten her lifespan. I'm happy to report she has been ulcer free for 1.5 years without the need for steroids. She has gained a little weight and is active and healthy as I've ever seen her. Hi, I adopted several strays a year ago and one of them has never looked quite right. I don't like the look of the pale pink eyelids and lips, his tatty coat that does not seem to regrow, and have had 2 episodes now of chewing away his fur, with trips to the vet for antibiotic and steroid shots. I neutered him about 12 months ago. Finally I have been given the name of the problem - EGC and am hopefully looking for research studies and more info. I feed a raw meaty bone diet - heaven knows what he has eaten for most of his life, which could be anywhere from 3 to 7 years. He has lost a lot of teeth, but his gums look fairly clean and healthy. I lean towards natural remedies, herbs etc., homeopathy. I am trying a zinc supplement added to his food, zinc is good for the immune system and for skin AFAIK. Has anyone else heard about using zinc for these cats? I hope some more owners post comments, its good to see how others are managing the problem. My 11 year old calico has had a rash on her lower stomach off and on since she was spayed. Over the years, it stayed intermittent, but for the last few years has been constant, and would worsen from time to time. Since Thanksgiving '11, she has had 3 episodes of bleeding from the mouth and the latest vet that saw her suggested this condition. She responds very well to steroid treatment, and I have no problem keeping her on steroids for the rest of her life, provided they continue to be effective. Hello, my cat has had egc since he was a few weeks old, came out right after his rabies vaccine, and I had tried the veterinarian way of steroids, shots, and recommendations, and have found holistic approaches to be the best controllers. I've changed his litter, feed, environment and it does go away, and it is self limiting, but the holistic vet that has treated it successfully in the past and can prove cures are out there, and that approach has the best control. 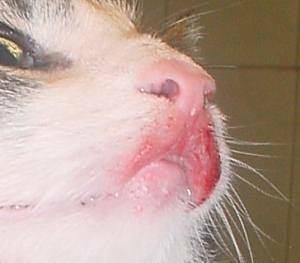 There is no need to remove lesions, get upset over how it looks or keep your cat on dangerous drugs. The cat is fine, he won't be covered from head to toe in lesions, and being persistent at trying what works is your best approach. Don't panic, and try holistic, it isn't harmful and you can always go back to the vet if you need to, though the two treatments clash, as the vet treats the symptoms and not the cause. By the way, I believe my cat's symptoms became much worse from being vaccinated too much, and since their immune system is down, I don't recommend vaccinating your cat until the symptoms have subsided for at least 6 months, so ignore the vet's postcards that you are behind on your vaccinations!!! You wouldn't vaccinate a child with cancer, so you shouldn't vaccinate a cat with immunity problems! Just change the bedding constantly (I use a few rags in a box from the grocery store, easy to wash or replace for him to sleep in) and don't gross out and keep him off the good furniture. You will find what ails him, when you keep trying different things like prescription or raw food (Feline's Pride), supplements etc. My cat has just been diagnosed! Thank you for this informational page. My cat has just been diagnosed, and the vet had minimal information for me. I had to look up basically everything I learned about it on the Internet. My cat has the rodent lip ulcers, the foot pad ulcers, and the rash on her stomach. She was given a steroid injection, her foot was cleaned out, and I was sent home with antibiotics for her. I am doing more research on my own. A good source of information is on the animal discussion group on ebay!